The presence of xenophobia is a disease unto society as it not only culminates in violence but systematically transgresses upon the rights of foreigners, and also alienates them on countless intrinsic social levels, and so pervasively influences society as a whole. Its very existence illuminates a weakness in the interrelationships upon which society is founded. This is a country that seeks to define itself not through its history of violence, but by its ability to struggle for and ultimately uphold human rights in spite of these obstacles. So while South Africa has been said to have a ‘culture of violence’, violence being a product of fear on a societal level, it is important to reconsider this, in a spirit of idealism, as being, potentially, a culture of courage, where this fear is confronted and resolved. 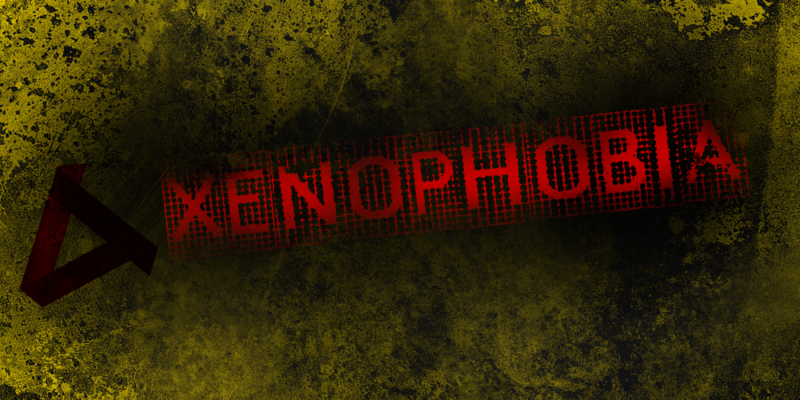 Understanding why xenophobia exists in South African society is key to confronting it. As with any social phenomenon, xenophobia is a thing that observers have offered varied interpretations of. There are three primary theories on the reason for xenophobia in South Africa: denialism, minimalism, and realism. It is important to evaluate how each of these theories may be useful to combatting xenophobia. In the simplest sense, denialism is the official stance of a government afraid of acknowledging the imperfections of a society still in the midst of growing pains despite the fact that acknowledging these imperfections is the only way to strengthen the whole. So it seems that denialism is only a productive course in the sense that it fosters a false sense of stability, where the true roots and causes of xenophobia are merely suppressed, and in their suppression, continue to wield substantial power. That is to say, it is hardly productive at all in engendering sustainable social stability. Then there is minimalism, which emphasizes economic factors. It is a theory entirely constructed upon the idea of material scarcity. Scarcity is a very real concern but not the sole source of xenophobia. Xenophobia is a distinct issue from distribution of wealth, as where poverty concerns all those who are impoverished, xenophobia encompasses only foreigners. Though these foreigners are often among the impoverished, and so could be said to worsen the competition for scarce resources in a bracket of people that most need these resources, the relationship is not so simplistic. For although these foreigners may be amongst those competing for resources, there is still a distinction in that not all of those suffering from poverty were targeted, but rather only those who were foreign were targeted. It is an entirely obvious distinction, that xenophobia does not culminate in violence against the poor, but rather, by definition, in violence against foreigners. But it is important to keep in mind when considering the minimalist theory, as this theory acknowledges the presence of economic factors while seemingly forgetting the fact of xenophobia. Thus, it is a productive theory on xenophobia only insofar as it examines the relationship between South African economy and the presence of xenophobia. And then there is the theory of xenophobia known as realism, which acknowledges the real fear of foreigners among South Africans. This theory is productive in that it finally acknowledges the force of xenophobia as having a profound effect. So the very theory of realism encourages a confrontational response to the social phenomenon. However, it is still crucial to consider the multifaceted meaning of xenophobia, its many contributing factors to truly understand why there is such deeply embedded fear of, and then, hostility towards, foreigners. Having a confrontational response to a problematic issue this deeply embedded in society, as the theory suggests, requires a powerful understanding of how it really exists. And understanding the reasons why xenophobia exists does not discredit the reality of xenophobia in and of itself, but rather serves as a more effective way of comprehensively addressing the problem.Therefore, realism is useful only to the extent that it considers the depth of the problem. In conclusion, these three theories each acknowledge different aspects of the problem and so offer different approaches to combatting the issue. Denialism is very limited in its usefulness as it advocates the preservation of only a weak social stability, while minimalism is useful to analyze the relationship between economic factors and xenophobia, and realism is useful for considering the actuality of the problem without understanding the factors that may be relevant to addressing it more comprehensively. There are, in fact, many ways of understanding xenophobia, as it has nearly limitless factors, from the economic factors implied by the minimalist theory, to its relationship to issues of race in South Africa, to the overt fact of South Africans’ prejudice against foreigners. Xenophobia could be understood, most fundamentally, as derived from social insecurity. It is a fear rooted in the individual human psyche, something that, through the web of social interrelationships, extends to the entirety of society. A comprehensive solution requires investigating xenophobia on a more fundamental level. In the first, then, this requires realizing the depth of the problem, as advocated by realists, as well as understanding the factors inherent to xenophobia, as advocated to an extent, by minimalists, though they only consider economic factors. And in the end, strengthening society ought to be appealing even to denialists. The idea that xenophobia is rooted in social insecurity can be evidenced in research. According to reports produced by the Southern African Migration Programme, many South Africans feel threatened by the mere presence of foreigners. This was exemplified in that many South Africans want draconian immigration measures enacted and do not believe in equal rights for immigrants. There are also widespread negative perceptions of immigrants taking jobs and being criminals. That South Africans feel so threatened by immigrants suggests that there is a degree of insecurity within South African society. Additionally, the study showed that many citizens believe that being truly South African is exclusive to those born in South Africa. This comes off as almost nationalistic, as though there is such insecurity about the South African identity that it must be divisively defined to exclude those who were not born here. The most singular and suggestive piece of evidence in the reports, however, is that personal interaction with immigrants erodes xenophobic sentiment. Genuine human interaction seems to overcome the social insecurity that underlies xenophobia. That xenophobia is rooted in social insecurity is evident in that it continues to exist despite attempts to deny it, and indeed exists perhaps most perpetually when unacknowledged, like most forms of underlying fear. Incidents since the most prominent outbreak have continued recurrently for years. In the first study by the Southern African Migration Programme, “Soft Targets”, there seemed to be a decline in xenophobia, though it cannot be determined whether this is due to fundamental social change or if it is just statistical anomaly. The researchers were doubtful that it is due to actual change in attitude, as government efforts, in their opinion, were not effective. That there has not been fundamental social change can be evidenced in the researchers’ finding that South Africans continue to feel ‘threatened by the presence of migrants and want to handle these anxieties by limiting migrants’ numbers, deterring their entry into South Africa and making conditions difficult for their existence here by restricting the rights and entitlements they can enjoy.’ And this fear is behind the outbreaks of xenophobic violence. Unless it is confronted, the researchers, concluded, xenophobia will continue to plague South African society. Firstly, formal acknowledgement of xenophobia is imperative to confronting the problem, as it is evident that xenophobia will perpetuate if not publically acknowledged. This might occur not only from a governmental position, but also in a truly public sphere, where it might permeate culture. It is important to understand acknowledgement of xenophobia not as an accusatory statement, but as an acceptance of the kind of vulnerabilities that develop in any human society. Then there is combatting xenophobia itself in all levels of governance and society. In terms of government policy, this means relaxing draconian immigration measures with the understanding that without legal status, immigrants are further socially marginalized and, above all, do not have their basic human rights met within South African society. There is of course legal argument for this, given the South African constitution’s promise of human rights to all people, not exclusively South African citizens. Less officially, there should be overall improvements in how immigrants are received, as it is all very well for rights to be promised in law, but as South African government has demonstrated in the past, there can be a disconnect between the legislation and execution of these laws. In particular, this occurs to the detriment of immigrants where there are systems incentivizing general corruption, and if there are underlying anti-immigration sentiments. Government does not exist in isolation to society; it depends upon it. Laws protecting the rights of immigrants rely upon people, who are subject to social mechanisms, to execute them faithfully. If there is more of an incentive for people within bureaucracies to work contrary to the interests of immigrants, then it is more likely that the rights of immigrants will be ignored. Thus, entire systems should be altered for the sake of oversight, so as to create systems that reconfigure social mechanisms in the interests of human rights. In a report put out by the South African Human Rights Commission, specific government agencies are targeted for aforementioned institutional change. The Department of Education should change the syllabus to include discussion of the problem of xenophobia. Past outbreaks of xenophobic violence can be studied to examine what further action can be taken in the future. This is absolutely crucial to protecting immigrants against possible future attacks. This includes having a preventative warning system, among other preventative measures, and having a plan for the mobilization of every part of government necessary to protect immigrants in case of an outbreak. South African Human Rights Commission should ensure disaster preparedness. The South African Police Service and South African Defense Force need to be cognizant of the rights and needs of immigrants. Department of Home Affairs needs major institutional change to be receptive to the needs of immigrants, so that they are not the victims of administrative justice, as they have been in the past. There are notable incidents of corruption in government, particularly in Home Affairs and in the police force. Immigrants and society overall would benefit from reforms to these systems. Department of Human Settlements and Department of Social Development need to work towards effective strategies of integration. This could be improved upon by reconfiguring governance systems to incentivize actions in the interests of the human rights of immigrants, as described above, so integration is achieved in a comprehensive manner. The relationship between immigrants and Department of Justice and Independent Complaints Directorate should be improved. Reforming bureaucratic structures that work against immigrants could also foster a better relationship between immigrants and the South African government, which would greatly enable their more harmonious integration into South African society. There is also a perhaps legitimate distrust of the government, judiciary, and law enforcement officers among immigrants which renders it difficult for policies to be at all helpful to immigrants, if they are unable to receive them due to this mistrust. It also alienates immigrants, as true integration requires a good relationship between immigrants and governing bodies so that they can genuinely participate within their society. This is particularly evident in the cases that were never justly concluded due to the problematic relationship between immigrants and the courts. This relationship, as stated above, needs to be improved. Local and Provincial Governments need to be sincerely adherent to national policies supporting immigrant rights. In the report, it was suggested that the programs for this so-called “reintegration” were not comprehensive enough due to failure of different levels of government to adhere to common goals. One component of this is that reparations be more effectively and fairly distributed, as many of those who were integrated did not receive these. Again, this entails a government capable of serving more sincerely in the interests of immigrants so that there is thorough adherence to pro-integration policies on every level of government, as well as a healthier relationship between immigrants and the government. The treasury, other departments and structures should also be aware and participate in combatting the problem of xenophobia. But in overall society, I think one of the most important things is integration on a personal level because this so-called fear of foreigners is most effectively combatted through strengthened ties to South African communities through personal, genuine interactions. This is an organic process fostered through community development. Community-building relies there already being equal opportunities for immigrants through access to government services, as described above. It is vital that these individuals have access to employment, housing, schooling, and medical services, as well as other services. It also requires the overall stability of the community, which entails addressing the problems inherent to areas that are impoverished, divergent from fair governance, and lacking in infrastructure to really meet the basic needs of the people. This is a much more intensive undertaking, requiring an investigation of how to mobilise people through sufficiently lucrative employment, creating a climate where enterprise can flourish, and channelling resources for economic transformation. This would, of course, depend entirely on the region developing fair governance, which entails comprehensive institutional change, as well as incentivizing this sort of change so that people are receptive and participatory in it. And all these things would rest upon sound infrastructure, particularly in meeting basic needs as well as meeting the needs of the people in these various transformations. Of course, to believe that these goals could be attained is at the very least, optimistic, but they should be worked towards, as there is much to be accomplished. It is important to have a comprehensive approach to integrating immigrants into communities. Then further steps can be taken to strengthen communities, various methods of community development. Community development strategies can be implemented through government actions, specifically through anti-discrimination measures, encouraging business partnerships between immigrants and other South Africans, and diversity in educational institutions and integrated settlements. That is to say, the policy measures taken by government, as described generally in the previous section, could be socially impactful in the creation of integrated communities. In conclusion, changes in South African governance and society could radically improve the situation for immigrants. However, xenophobia seems to expose an overall insecurity in South African society. Awareness of the vulnerabilities implicit to human society are key to strengthening it. Realization of these vulnerabilities can then lead to effectively confronting these that are problematic to ensuring the rights of all people within South African society. This requires extensive social transformation, both in the ways outlined above, as well as in innumerable less direct ways, nothing short of revolutionary changes in the collective consciousness of society in South Africans’ relationships not only towards foreigners, but also towards one another.